Reliefweb has once again proven to be an excellent source for knowledge, my latest ‘discovery’ is the “Global risks 2014”-report from the World Economic Forum. The report presents and discusses the top10 risks that society is perceived to face in the decade to come. The report is based on a survey of the World Economic Forum´s communities and maps 31 global risks. It includes interesting visualizations showing how various risks are truly interconnected with cascading effects. 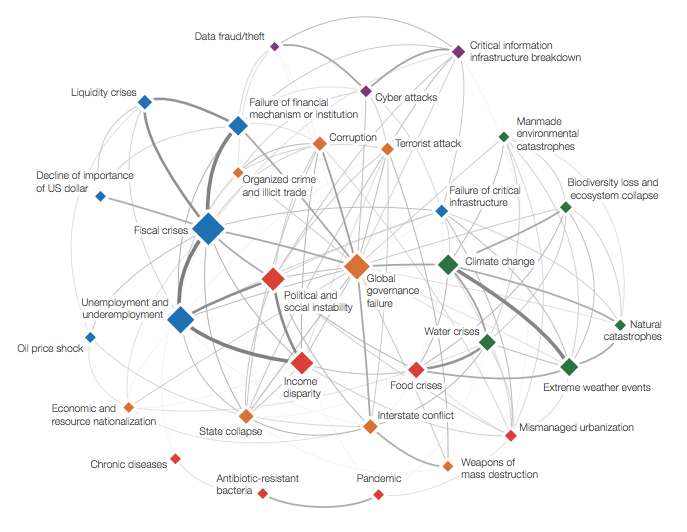 Professionals and academics focusing on crisis and disaster response have particularly good reasons to read the report since it provides good examples of how to visualize complex phenomena from a systemic perspective. in Crisis and Emergency Response <Loved it!